Regulars to the blog know that I have absolutely no knowledge, skill, or practice in cooking any of the cuisines of Eastern Europe. Regulars will also note that this doesn't stop me from trying to cook the cuisines of Eastern Europe. You can tell about my lack of knowledge about Eastern European cooking with the simple fact that I'm lumping all the cuisines from one half of an entire continent together as if all the countries in that half of the continent shared one distinct culinary tradition. 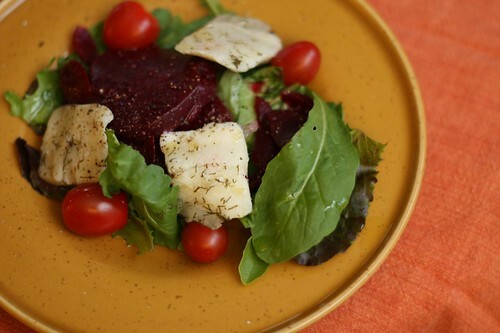 Since I was making an Eastern European meal I figured I start off by making a salad that I imagined Eastern Europeans might make. I didn't do any sort of research to back this up. Instead, I did the next best thing and went with my gut feeling. 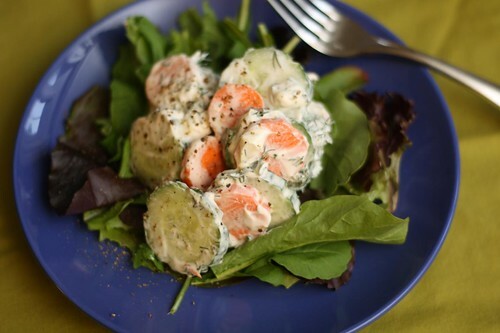 I sliced up a cucumber and carrot and tossed them together with sour cream, dill, salt, pepper, and apple cider vinegar. I served it over some mixed greens. I'm not sure how this was because I can't stand cucumbers. Instead I made only one of these salads for Jen. Blue Hill Bay is one of my favorites. Jen, on the other hand, can tolerate about one or two tiny pieces a decade so I enjoyed this all by myself. 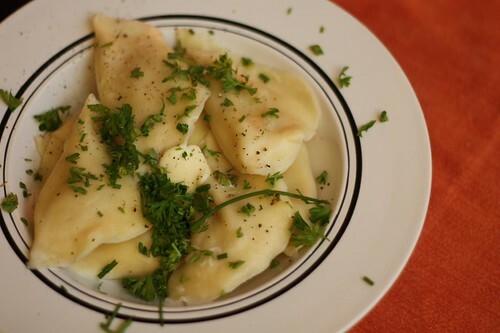 For the main course I made up some very simple potato and cheese pierogies which I tossed with fresh parsley, chervil, chive, and melted butter. 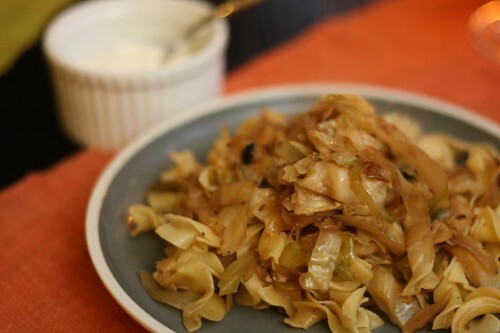 I wasn't really sure what to do as an accompaniment but I found this recipe for haluska which is a Hungarian dish made with cabbage and noodles. I toasted some carraway seeds in butter and olive oil, browned some onion, and tossed in some chopped cabbage. At the end I tossed in some cooked egg noodles. Traditionally (I guess) you're supposed to toss this all together with sour cream. I was a little suspicious of this so I served the sour cream on the side. With the beers of Canada thoroughly conquered over the past couple of weeks (Canada only has ten beers, right?) I moved back to Belgium this evening. 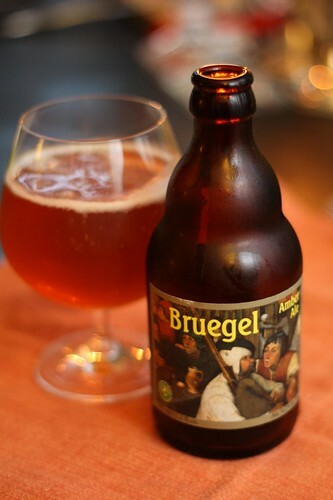 Tonight I enjoyed the Bruegel Amber Ale from Bouwerij Van Steenberge. I must confess that I chose this one simply because it looked the most Eastern European. I figured that those guys on the label could possibly have been Poles. Well, medieval Poles. Medieval Polish monks. Who may also have been Belgian. My hastily-themed meals always fall apart under any sort of scrutiny.